The US Navy’s new futuristic diving suit – billed a prototype for “a new life support system for divers” – is a semi-enclosed system developed to accelerate deployment, conserve helium gas and increase safety. US Navy members in mobile diving and salvage units currently use the Fly-Away Mixed Gas System (FMGS), a helmet with an umbilical tube that connects to surface supplied gas. When a diver exhales, it is through a vent to the sea, and a large portion of oxygen and helium gets wasted. The new diving suit prototype was created by scientists at the Naval Surface Warfare Center in Panama City, Florida. "The new system modifies the current helmet and rebreather. Prototype analysis and testing have shown that drastic reduction in helium consumption is possible," Dr. John Camperman, NSWC PC principal investigator, said in a statement. "Testing of the new prototype system indicates that the full range of FMGS diving is supportable within Navy life support requirements, and that several life support characteristics are improved, including extended emergency come-home gas duration." The US government is always trying to trim defense budgets, leaving military divisions exploring ways to cut costs. There are three costs associated with diving missions – transportation, support vessels and helium. Helium is a valuable and costly natural resource; by conserving the amount needed during a mission, the Navy can save on transportation costs, cut down on deck space and use a smaller vessel, and decrease its use of helium. "This new, semi-closed system was conceived to drastically reduce helium requirements," said Camperman. "And where possible we also incorporated proven technology in the system in order to speed transition to operators." 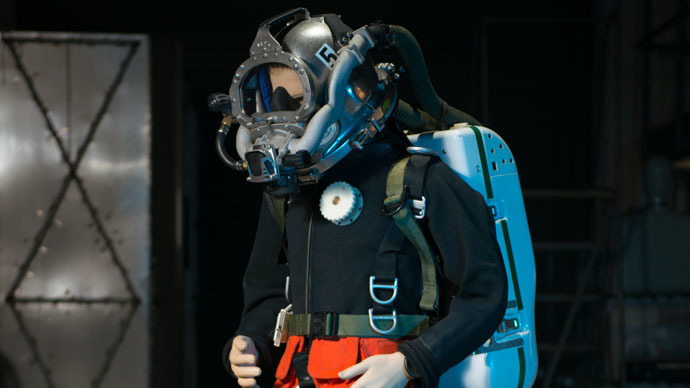 The new diving suit prototype is an innovation by the Navy’s Initial Response Diving project. The goal of the project is to use science and engineering “to support faster recovery of objects in deep waters.” The Navy wants to provide divers who can go down to 600 feet anywhere in the world and stage recoveries within 36 hours of deployment. The missions might include rest and evaluating a mine warfare system or a humanitarian rescue.